The Foods for Life Parklet is a removable/ recyclable installation that brings green and human-scaled relief to a hard street environment, here in Gawler Place, the City’s second busiest pedestrian thoroughfare. If the need arises it can be removed in a matter of hours and re-deployed to another location. Fabricated from steel and timber, it can be recycled. For now though, in this current life, natural finishes reflect the focus of the health food shop; and pre-existing internal colour-branding is drawn outside on tabletops. Its planted edges not only bring a small pocket of greenery to the street, but its deciduous elm sits proudly as a symbol of the seasons in an environment overwhelmingly of things man-made. Having been successful in a submission to be part of the Adelaide City Council Parklet Program, FOODS FOR LIFE sought out Troppo to assist in designing and working through a procurement maze with multiple stakeholder interests. Not only was this a <span>pilot project</span> for ACC, but that the clients had just taken on the business and were still finding their feet added to the excitement. ...But already it is finding itself to be a niche destination for the downtown Community; and it has proven a financial success for the owners. 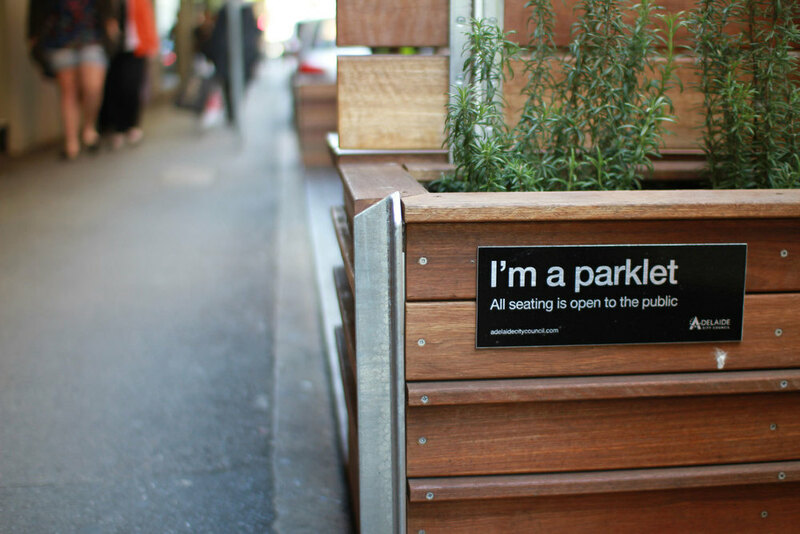 The Parklet has become an exclamation mark along Gawler Place, an installation that stops people, allowing them to notice and enter a shopfront that often they previously walked past.